Inspired by nature and tropical storms. When walking along a beach after a storm has passed you can find patterns that are unique and un-touched by human. This has been transferred onto glass using a free-blown technique: the vessel is blown with two layers of coloured crystal glass. Each piece is individually hand-blown and unique. 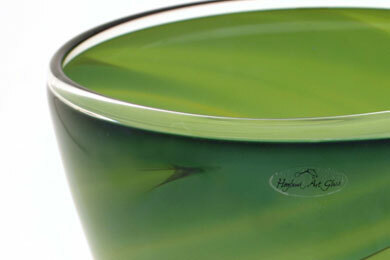 No piece can every be the same, as the nature of handblown glass determines the individuality of each object. The design in this process is unique, just like each pattern on the beach after the storm has passed.